International customers** Due to the size of this game, we can only ship to countries that allow box dimensions greater than 79" via Priority MailÂ® International. You can check your country restrictions at usps.com Thank you. To commemorate this momenteous and joyous event, a special edition is being created. The special edition will encompass Settlers of Catan and Cities and Knights for 3-4 players. This edition will feature three dimensional hand painted tiles made of dense heavy weight resin and a complete interlocking border. Each player will have a set of hand painted settlements, cities, metropoli, city walls, knights and roads. The special hardwood case is designed to keep your set safe and will feature a special slotted level with felt lined slots to hold each hex. A wooden tray to hold pieces for play and storage. IMPORTANT INFORMATION: Due to the size, weight and availability, we will not be able to offer any special discounts on this item (ie, you cannot use freeship125 or savemoney). When ordering, this item should be the only item in the order. 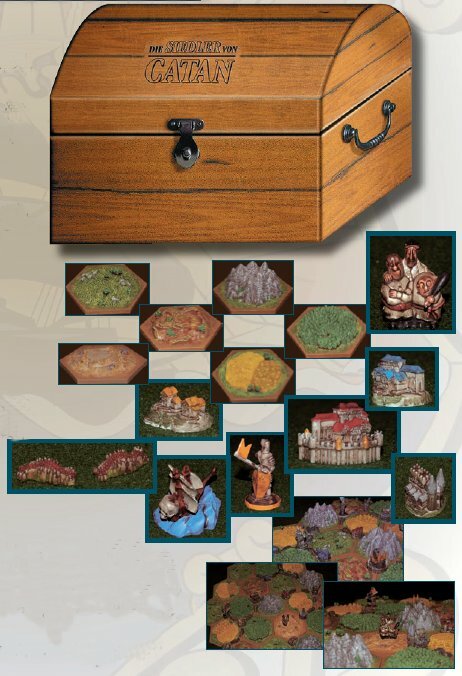 If you wish to order more than 1 Settlers of Catan 10th Anniversary 3-D Special Edition Chest Set, you must create a separate order for each individual game. The game is fantastic and the 3-D makes the game come alive. Down side, they do not make replacement cards for the 3-D, so when you wear them out forget about the special trays, to hold them. I had an opputunity to play this version and it was amazing. If you have the resources to pick up this game and you love catan it is a must have.